TriFusion, a unique fitness studio in the heart of Crestline Village, offers a variety of exercise classes ranging from intense cardio circuit training to relaxing yoga, and much in between! Variety is the spice of life! When you do the same exercises repeatedly, your body grows accustomed to them. Help your mind and body by doing different workouts each week. TriFusion classes cover five important elements of fitness: aerobic/cardio, strength training, core exercise, balance training, and stretching. We are a one-stop shop. The variety in our class schedule incorporates the TriFusion method: an all encompassing total body, fused workout. 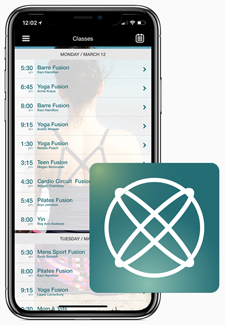 Our method is strategically designed for everyBODY- runners, yogis, cross trainers, women, men, and children – producing significant physical and mental results. All of these TriFusion classes balance and tone the body, ultimately increasing your energy, flexibility, and strength. Sign up for classes and view class schedules. Select your app store below.